Eighteenth-century French royal. A member of the House of Bourbon, he began his reign as King of France and Navarre in 1715. He succeeded his great grandfather, Louis XIV, as King of France, taking the throne at the age of five. During his reign, he conceded land to Austria and Great Britain, weakening the position of the French monarchy and laying the groundwork for the French Revolution. He was born at Versailles to the Duke of Burgundy and Marie Adelaide of Savoy. He married Marie Leszczynska in 1725; the marriage produced several children. 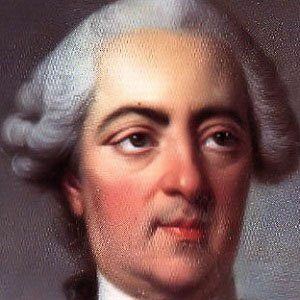 After his death from smallpox, his grandson Louis XVI became King of France.